Interview Exclusive: tutti frutti’s Wendy Harris Chats About WILD! Following on from their acclaimed 2014 production of MONDAY’S CHILD which explored Alzheimer’s disease, theatre company tutti frutti return to the stage with their new play WILD! Written by award-winning writer Evan Placey, WILD! tells the story of 10-year-old Billy who has been diagnosed with Attention Deficit Hyperactivity Disorder (ADHD). The one-person show captures Billy’s funny, quirky and wild imagination and features live music by Molly Lopresti. Ahead of the performance at York Theatre Royal, Frankly My Dear UK caught up with tutti frutti Artistic Director Wendy Harris to chat about the play and her inspiration for the piece. “I guess the idea started with tutti frutti” comments Wendy. To create an accurate portrayal of a child with ADHD, Wendy and her team worked closely with Professor David Daley of CANDAL (the Centre for ADHD and Neurodevelopmental Disorders across the Lifespan at the Institute of Mental Health) and his team at University of Nottingham to understand the behavioural condition which affects one in 20 children in the UK. “Our starting point was to really thoroughly research the science and medical aspects” explains Wendy. Aimed at children aged 8 years upwards, WILD! uses live music, movement and sound to connect with the young audience. 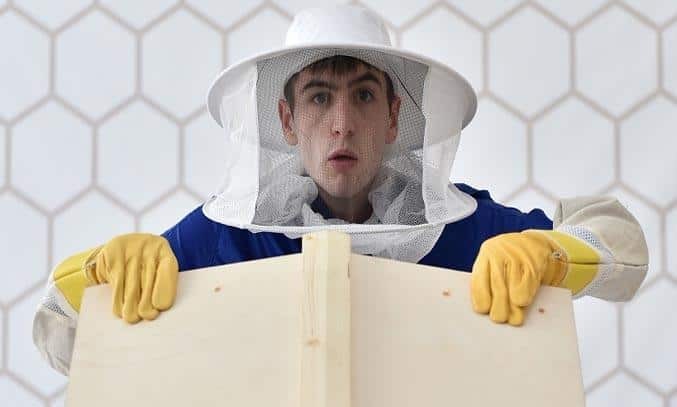 In the play, Billy takes over the care of his absent father’s bee hive and the bees become a metaphor for Billy’s condition, as well as the journey he takes as he gets medicated. “Because our audience is children, we wanted it to be from a child’s perspective so our main focus was around putting the character in the story in the shoes of a child” explains Wendy. While ADHD is at the heart of the story, Wendy is keen to point out the story isn’t just about the condition, it’s a story about being misunderstood, something which many children can relate to. Since its premiere at The Carriageworks in Leeds on the 30th April, the play has been on tour around the UK and has certainly had an impact on its audience. “The reaction so far has been absolutely amazing” comments Wendy. WILD! is currently touring the UK until 10 July 2016.